Art that understands itself as politically motivated is at present quite frequently falling back on documentary forms of art. The claim usually leading to a documentary comprises criteria of objectivity and truthfulness, of re-presentation in a mimetic sense; the attempt is made to come as close as possible to reality, while omitting personal filters. The documentary method, which can make use of visual, textual, oral, or audio means, reveals in a reflective way the manner in which the documentary work originated and was produced. 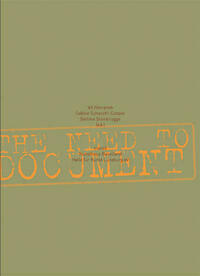 Documentary working methods in the field of art currently take on two opposite functions: On the one hand, they stand for a strategy of authenticity that is to ensure the artworks' claim to establish contact with the aural sphere of the social or political; on the other hand, they perceive their own means as socially constructed ones, as epistemological tools with which not the truth of politics but the "politics of truth" are to be changed. 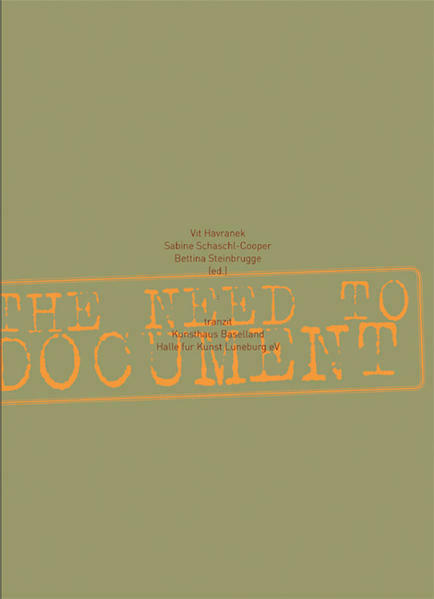 * * The book "The Need to Document" attempts to make out the backgrounds leading to this turn towards documentation, as well as the thematic focuses and concerns associated with this new documentary stance. The interests of new documentary working methods in art remain reflectively close to the inherent laws of all known documentary channels, but additionally assert their own special features and logic. * * Published with the Kunsthaus Baselland, Basel, the Halle für Neue Kunst, Lüneburg, and Tranzit, Prag.